History: Chandler, Arizona, was named for Dr. A. J. Chandler, who was the first veterinary surgeon for the territory of Arizona. He settled in the area in 1891 and owned an 18,000 acre ranch. 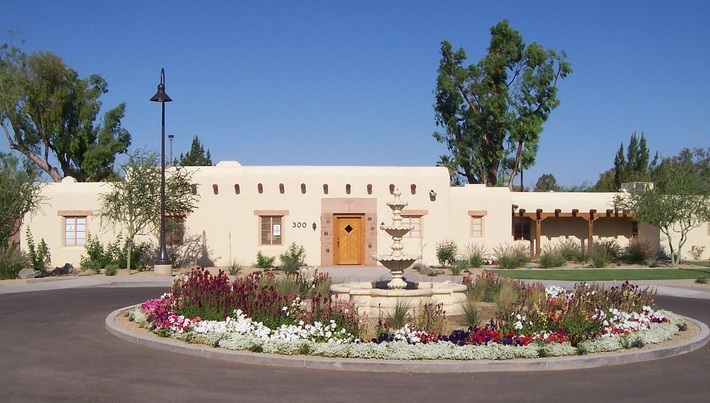 The town of Chandler began in 1912 with the opening of the Townsite Office. In May of 1920, the citizens voted to incorporate and become the Town of Chandler. Dr. Chandler agreed to serve as the first mayor. A unique historical overview of how the major streets in Chandler were named: Most of the north and south streets in the original town sites were named after states, and the east and west streets were named after American cities. Several of these names remain today, like Boston Street, California Street, and Arizona Avenue. Historical Residence - McCullough-Price House - This home was built by William McCullough, a Detroit resident who spent his winters in Chandler. The home changed hands in 1942 when it was purchased by the Lockhead family (who managed the Pecos Valley Milling Co.). In 1950, Arthur and Louise Chandler Price (Louise was the niece of Dr. A.J. Chandler) purchased the home and it stayed in that family until 2001, when Suzanne Price Propstra donated the home to Chandler. The home was restored between 2006 and 2007 and is currently used as a visitor center and museum. This home is on the National Register of Historical Places. Chandler's Commercial Historic District - There are numerous buildings in Downtown Chandler that are listed on the National Register of Historic Places. The Hotel Chandler Building was built in 1914 and was located at 98 San Marcos Place, Chandler, Arizona. Chandler’s first elected mayor, David A. Jacobson, financed the construction of this building. The bottom floor was leased out for stores, and the second story was a reasonably priced hotel, an affordable alternative to the San Marcos Resort. Many prominent Chandler businessmen, especially those working downtown, kept permanent residence in rooms at the Hotel. The building is listed as historical by the Chandler Historical Society. A jewel in the desert was Dr. A. J. Chandler's dream. That jewel was the San Marcos Hotel, a centerpiece for the town that bears his name. In the hotel's early years, when it served as a hide away for the rich and famous, it helped put Chandler on the map. Later it served as a place for special events. It celebrated 100 years in 2013 as a landmark in Chandler. Another Historical Property - There is a Southern Pacific Railroad Locomotive and a Railroad Steam Wrecking Crane and Tool Car which are listed in the National Register of Historic Places. They are on display at the Arizona Railway Museum which is located in Chandler. Click here to contact the webmaster! ​The content contained herein does not necessarily represent the position of the NSDAR. Hyperlinks to other sites are not the responsibility of the NSDAR, the state organizations, or individual DAR chapter.